1. Navigate in the folders panel to Setup -> Message Categories. 2. Open an existing message category or create a new one. 3. In the dialog, enter the details of each callout you require into the relevant field. See below for more details. The On Write callout is called when Deltanji has written a message of this category. See below for information about the contents of the oAudit array. The On Actioned callout is called when a flagged message of this category has its flag cleared by a user. Audit message callout code must be written as a subroutine that accepts one parameter. The suggested name for the parameter variable is oAudit. Deltanji will pass by reference a local array containing some or all of the following first-level subscripts. Note that the message category must be persistent otherwise the oAudit array passed to the callout will be empty. dateTime Timestamp of message in YYYYMMDDHHMMSS format. 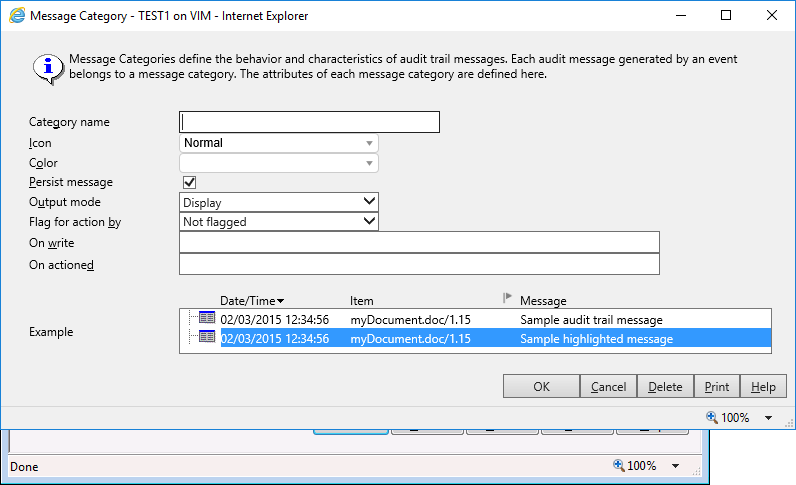 user ID of the user creating the audit message. message The text of the audit message. changeRequest If message was logged against a change request, the name of the change request. Null if the message was logged against an object. object Object base name if message logged against an object. Null if logged against a change request. variant Object variant name if message logged against an object. Null if logged against a change request. version Object version number if message logged against an object. Null if logged against a change request. objectVersion Fully-formed object name if message logged against an object. Null if logged against a change request. session Session ID from which the message was logged. May be null. transaction Transaction ID within which the message was logged. May be null. actionBy If message was flagged for action, user ID for whome flagged. Otherwise null. actioned 'yes' if action flag is not set. Otherwise 'no'. Will always be 'yes' on the On Actioned callout. Will be 'no' in the On Write callout if message is written flagged for action, otherwise 'yes'. revision Internal revision number of persistent audit message record. Used for detecting concurrent updates. event Subtree containing data about the event for which the audit message was logged. Second-level subscripts and descendants contain this information. Structure depends on the type of event. Possible values of second-level subscripts include: action, compile, delete, error, export, import, transfer.